Josiah was a God-fearing king. In the eighth year of his reign, when he was still young, he began to seek the God of David his father, and in the twelfth year, he began to purge Judah and Jerusalem from the high places and the groves and the carved images and the molten images (2 Chron 34:3). He did many more things to please God – he removed all the heathen altars and images and broke them down, he repaired the temple, encouraged the servants of God, etc. And the Passover feast that he celebrated was unparalleled (2 Chron 35:18). There are many other good things to say about Josiah. In fact, long before Josiah was born, a prophet of God prophesied about the great things this king was to do for the glory of God. However, such a saintly king became proud! When the king of Egypt, Necho, went to fight against Carchemish, Josiah also went to fight against Necho. Necho sent word to say, God commanded me to make haste: forbear thee from meddling with God Who is with me, that He destroy thee not (Vs 21). When we fight and quarrel, what we are really doing is, fighting with God. The Egyptian king made it clear that he was going to battle as guided by God, but nothing seemed to restrain Josiah’s proud and haughty spirit. He imagined he was going to show Necho how great he was. “And the archers shot at king Josiah… his servants therefore… brought him to Jerusalem and he died” (Vs 22, 23). Let us turn to our God with all our hearts and examine ourselves and see whether this foul spirit called pride is hidden in our life. 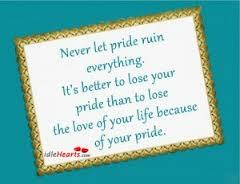 It is rather frightening, and yet true, that although we may have many superb qualities, if we let pride get into our life, we can end our life in disgrace – as if we had no divine virtues in our life.